One of the most traditional proteins served for Easter dinner is lamb. 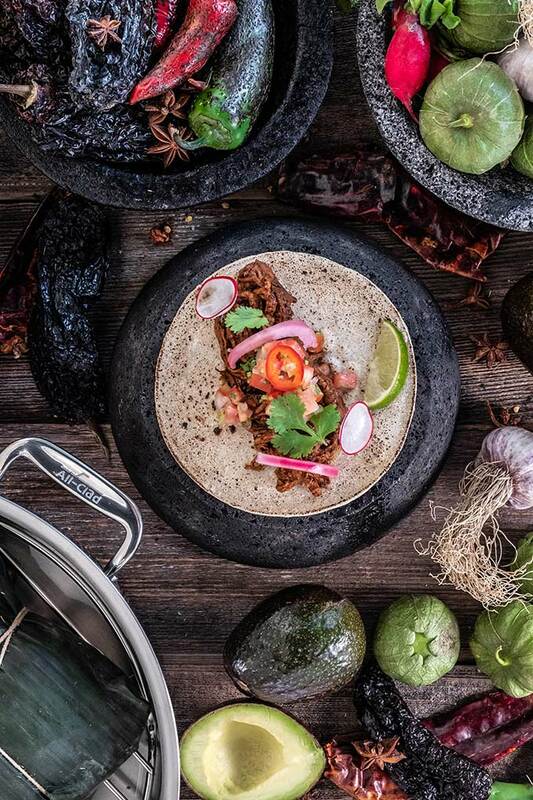 This year, you can put a twist on tradition and surprise your guests with Lamb Barbacoa Tacos, a traditional Mexican dish, courtesy of Chef Alex Chen and All-Clad Canada. The delicious seasoning blends familiar flavours like cumin, peppercorn and cinnamon with exotic spices like star anise and ancho chillies. Check out ther recipe below. Toast dry chillies over a grill on low heat for 1 minute. Soak the chillies in hot water for 20 minutes to soften. Remove the chillies from the water and remove all the seeds. Grill the onion and garlic on medium heat until slightly blistered. In a dry saucepan, gently toast the cumin, cloves, star anise, peppercorn and cinnamon stick over a gentle heat for 3 minutes, gently moving the pan around the stove to agitate the spices. Blend all ingredients together until smooth in a high-speed blender and set aside. Wipe the wax off the banana leaves with a damp cloth. Overlap the banana leaves, at least 2 layers. Season the lamb with a generous amount of salt. Spread the adobo paste on the lamb until fully covered. Wrap the banana leaves around the lamb to form a tight parcel and tie with butcher’s twine. Add 2 cups of water to the bottom of your HA1 Hard Anodized Nonstick Roaster and put in the roasting rack. Place lamb parcel on the rack, cover with a lid. Cook for 4 hours, checking after 3 hours – the meat should be fork tender. Add more water if needed and cook further until desired tenderness. Combine the lamb with the liquid from the bottom of the roaster in a bowl and shred the lamb into small pieces with a fork. Adjust seasoning, adding in more adobo if desired. Grill tortilla shells spraying with water from a spray bottle to steam the tortilla. Place 1 large tablespoon of lamb on the tortilla and garnish with pico de gallo, shaved radishes and cilantro. Put lime wedge on the side. Alex Chen is one of Canada’s most respected chefs and an All-Clad Canada Ambassador. 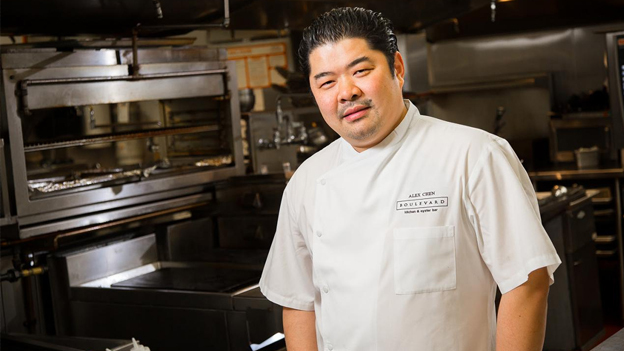 Chen spent six years as executive chef at the legendary Polo Lounge in the Beverly Hills Hotel and currently heads the kitchen at Vancouver’s Boulevard Kitchen & Oyster Bar. In 2013, he led Team Canada to a top 10 finish at the prestigious Bocuse d’Or in Lyon, France. More recently, in November of 2018, Alex became the first challenger whose “cuisine reigned supreme” on the inaugural season of Iron Chef Canada when he defeated Iron Chef Hugh Acheson in the fourth episode of the Food Network Canada cooking competition television show. Alex’s culinary vision is an inspired recipe of family tradition, classical technique and an artful infusion of casual West Coast flair and international influences.